Starbucks being my go-to place started in Singapore when I used to live there. An inviting and convenient place, Starbucks was a haven, offering me a refuge from the ugliness of the world, people’s prejudiced notions of people, and simple weariness. On a more mundane note, I got hooked on the offerings of beverage and pastries which were something I looked forward to seeing because there was always something new on the menu wherever you were in the world – Los Angeles, Singapore, Manila or Indonesia. Trooping down to my usual Starbucks haunts in Bekasi, Indonesia, either at Metropolitan Mall or Grand Metropolitan, they started the first month of 2019 with a roster of new drinks – a Caramel series – and a delectable pastry cup. Having weaned myself from coffee, it would seem that I would have to give the new Caramel Pudding Frappuccino, Caramel Pudding Macchiato, and Caramel Pudding Matcha Latte a miss until I was told that the Caramel Pudding Matcha Latte was a non-coffee drink, and that she, the barista, could bring the sweetness a notch lower. Green tea is really versatile, blending well with almost any ingredient. The melding of the matcha with the caramel pudding was simply superb – it was smooth and balanced on the palate. It is best sipped cold, I say. The pastry display was looking a bit nondescript having grown tired of the usual chocolate croissant, dark chocolate cake, and the triple chocolate muffin. I wasn’t keen on the pandan sponge cake or the lamington. But surprise, surprise! The Raspberry Trifle Cup seemed to be doing a jig to get my attention. It got me at trifle – a sponge cake with jelly, custard and whipped cream. In Starbucks’ version, the vanilla sponge cake was cut into cubes and placed in a bed of raspberry puree then swirled with whipped cream. The final touch was a topping of crumbed chocolate chip cookie. It is best eaten chilled; make sure you slide the spoon all the way down to the raspberry for that complete sweet, fruity, and creamy bite. I am hooked on these new Starbucks treats and wondering what and when they will roll out the new treats. Chatime was the undisputed milk tea place to get your boba fix in Bekasi, Indonesia. It is boba for the Americans and ilk while it is pearl for the general Asian market. For the Filipinos specifically, it is called sago. Whatever term is used, it refers to those dark gelatinous tapioca balls that add the chewiness while sipping the milk tea. Lately, a smaller, lighter colour version – more golden brown – was introduced by Chatime which they call golden pearl. The only Chatime outlet then at Bekasi was at Metropolitan Mall, 25-year old mall, with its counter-bar located next to Ace Hardware. It was an instant favourite among the young and old. There are now at least four branches of Chatime, each found in the popular malls around Bekasi. Chatime is also mobile, participating in, for example, Fortals, the annual school concert of Global Prestasi School, with a pop-up tent. The catch though is that the drinks are pre-mixed so you cannot adjust the sugar and ice levels. Through the years, Chatime adds seasonal flavours to their menu such as a fruit series and, my favourite, Thai milk tea which was sold last year. This January Chatime is courting their regular and potential customers with their new mousse series – black tea, chocolate, and matcha. Ordering my regular no sugar-no-ice pearl milk tea at Chatime was a bit of a challenge for the crew and me because my Indonesian was far from smooth and their English was spotty, but we managed. They are patient. Meanwhile, the staff at KOI take to English like fish to water. Now, Chatime is in for some competition for star of the milk tea stage. Sometime last year, amidst the closing of old stores and opening of new ones at Metropolitan Mall, KOI Cafe opened claiming the old spot on the second floor of the first Starbucks that opened in Bekasi which had moved to the ground floor of the mall. Its name doesn’t scream milk tea – more like those orange-gold fish – unlike its rival but it is a milk tea place that is also serves foam coffee, milk tea, and tea with cream. With two places to get my boba fix, my mood dictates where to head when I am hit by a wave of boba craving. If I am not enervated, I bound up to the second floor for KOI and its smooth, silk-like texture sans the caramel aftertaste, and lighter feel on the tummy. KOI has the no sugar-no ice option for all its drinks like Chatime, but its boba is the golden one unlike Chatime which is a seasonal offer. Another push-factor is the place to sit. Given that KOI is has Starbucks’ floor plan, KOI utilized it to their advantage, taking the furniture game a notch higher by providing long sofas along with the usual chairs done in elegant ebony. Chatime at the basement of Grand Metropolitan renovated their spot to include a couple of chairs and tables, but it is not suitable, unlike KOI, for quality reading or getting some work done. The only problem I find with KOI is the serving size; they only have small and medium and the small size is smaller than Chatime’s regular size cup which, at times, is around three to four sips short of satisfying the boba craving. Chatime or KOI? What is your mood? Settle that question and then go get your bubble tea. It was intriguing. Who would dare sell it in the Philippines? I am talking about kisses because kisses were what zipped through my mind when I saw the banners fluttering along the drop-off point at Greenbelt 3. I didn’t see the phrase after XOXO until I saw a poster at one of the entrances to the shopping complex. The ads were not referring to smooches, but XOXO handcrafted ice cream, which had been serving cups of ice cream rolls since November 23 on the third floor of Greenbelt 3. Standing right in front of the cinemas, its black and white colours wave at you, beckoning you to try a cup of ice cream which is hand rolled on the spot. The concept, I learnt from one of the amiable trio on duty, came from Bali; the business enterprise is owned by a New Zealander and an Australian, partnering up with a Filipino for their venture in Makati. Discovery 2: the Filipino owner – a part owner, she says – is one of the crew I met that January, who learnt the craft in Bali, “chopping” and “rolling” for four days while squeezing in strolls around Kuta and its famed beach. Discovery 3: the crew is trained to be a little more bonhomous than usual, and advised to replicate what is done in Bali. Picture the crew calling out to passers-by urging them to have a cup of XOXO, asking for their names, and engaging them in chit-chat. The Greenbelt crew, the part owner shared, were a little shy, prevailed upon by Filipino culture never to really engage strangers in a conversation much more call them by their first names. Filipinos are generally trained to address people – strangers and whatnot – as Sir or Ma’am punctuated by “po“, which is short for opo, a Filipino word uttered at the end to signify respect. XOXO’s ingredients are the same as the ones used in Bali – no cost cutting by finding a cheaper substitute. For now, XOXO ice cream can only be eaten from cups, but they are working on getting their waffles cones out soon. Also in the pipeline is the third outlet at BGC; a second one is already serving the delectable ice cream at NAIA Terminal 3. Care for purple ice cream? Try the I am what I yam. There are 12 flavours to choose from, each one creatively titled and presented. All the flavours are the same as in Bali except for three which are Filipino-centric. The first is Mabuhay, an homage to the Philippines’ halo-halo, a snack or dessert of shaved ice and a hodgepodge of sweet local ingredients that include fruits and sweet preserves topped with a dollop of yam paste and a cube of flan, and swirled with evaporated milk. Next is “I am what I yam’, a tribute to the halayang ube, or boiled purple yam that’s mashed and mixed with condensed milk, sugar, and butter, that can be eaten on its own or paired with something like halo-halo. The last is “Manny’s Fruit Punch”, an ice cream concoction named after boxer and politician Manny Pacquiao. For the curious, the concoction “The Godfather”, a chocolate concoction smothered in crushed Maltesers, milk chocolate chips, and chocolate biscuit Tim Tam, is the most popular choice among their customers. Stoked to try the ice cream, I went for “La Land”, a gluten-free cup of white chocolate ice cream with white chocolate chips, and drizzled with salted caramel on my first visit with a friend. It was smooth and packed tremendous flavours, but sans that saccharine sweetness and heaviness on the tummy. My friend, Joy, chose “Matcha Lychee”, a cup of gluten-free green tea ice cream topped with mochi and drizzled with chocolate sauce. She was in seventh heaven. One visit was not enough. My second visit was with my Uncle Ric right after our lunch. We decided to share a cup of “I am what I yam”, yam ice cream topped with yam mochi and ube wafer sticks, and sprinkled with ube bits. It is a Filipino thing – your life wouldn’t be complete without ube in any of its reincarnation. Dig into La la Land! For P195 a cup, believe me when I say XOXO hand crafted ice cream is better than any kiss from a former lover. To tell the story of Bottega, let us begin with the sticker. A visit to the vineyard by a commission is the first step in the process followed by wine tastings before the wines are bottled and shipped to various destinations. If the commission finds the taste agreeable, or up to standard, then the seals are issued. All Bottega wines have the D.O.C seal, a ‘sticker’ given by the government of Italy, on the bottles which attest to the vineyard having passed all the requirements set by the government, thus they are not to be sold as regular table wine. Getting the coveted sticker is not a surprise since Bottega is pernickety about making wine which begins with the selection of grapes. Take the Bottega Soave Classico D.O.C 2016, which comes from Soave City. Made from the best gargarega grape, a type sourced from the 355 varieties of local grape in Italy, it has become the quintessential soave with its medium body, flower-peach notes, and a slight bitter aftertaste of almond. Soave has been around and was very popular between the 1950s and 1960s, but the quality was mediocre. Bottega reintroduced it into the market with a taste that breathes quality. Bottega was in Indonesia on 30 November 2018 for a Bottega Wine Dinner featuring five of their prized wines. Held at Hotel Mulia’s il Mare, it began with a pre-dinner drink of sparkling wine, Bottega il Vino dei Poeti Prosecco D.O.C., complemented by bite-size corn croquettes at the bar. Prosecco is strongly challenging the reign of champagne in the sparkling wine industry as the preferred drink for any occasion. Wine drinkers are now gravitating towards Prosecco for its fruity taste, low acidity, and low alcohol content compared to champagne. The lower alcohol content is due to the short fermentation period of only between 40 and 50 days. It fact, it is because of Prosecco that Italy has been named the largest wine producer in the world for the last three years. Served in a large wine glass instead of a traditional wine flute, I was told it was to let the aroma waft through the air and tickle the drinker’s nose. Next on the menu was lobster roll with capsicum and heirloom tomatoes paired with Bottega Soave Classico D.O.C. 2016 which whet the appetite for the next dish and wine pairing of ossobuco agnolotti and Bottega il Vino dei Poeti Rosso di Montalcino D.O.C. 2015. Coming from Montalcino where only eight percent, or 24,000 hectares, of land is used as vineyards and the rest are planted with olive trees (think olive oil), grape production is very limited with each vine producing only 1.2 kg of grapes for quality wine. Close at the heels of Montalcino 2015 is the vintage Bottega il Vino dei Poeti Brunello di Montalcino D.O.C.G. 2010 which went well with the smoked grilled beef short rib with endive and mushroom that my friend had or, being a non-beef eater, the alternative dish of ravioli chicken mushroom I had. Brunello is made from a very sensitive type of grape called santroveza – its quality changes when there are changes to the area of cultivation. It must be aged for two years and resting in a bottle for four months to get that sophisticated taste and good acidity. A bottle of Brunello can be stored between 20 and 30 years. Rounding up the wine dinner was the dessert wine Bottega Fragolino rosso and the digestif Grappa d’ Amarone Alexander, which is also produced by Bottega. The strong and smooth grappa helped to make room for the dessert soon to arrive. Fragolino is not new in the history of Italian wines. Produced from a type of grape called Isabella which tastes like strawberry, it was very popular between the 1930s and 1950s, but was banned by the government when wine drinkers decided to be wine makers in their own kitchens. In the 1990s, Bottega reincarnated it as the Bottega Fragolino rosso, a merlot cabernet-based wine infused with strawberry, which is prepared like Sangria, and mostly drank in the summer. But that night it accompanied the delectable dessert of strawberry tart with mascarpone, yoghurt mousse, and coconut snow to end the Bottega story on a sweet, fruity note. What’s on the menu at Publik Markette? It was only when I had properly perused the menu and observed the set up did the concept of Publik Markette sink in. Located at the East Mall of Grand Indonesia, Publik Markette is perfect particularly for three hungry friends with diverse culinary tastes. Emphasizing its market concept, the menu presents a variety of cuisine especially the three popular ones in Indonesia, viz. Japanese, Western, and Indonesian, from which diners can choose from just like in a market. The idea is reminiscent of Marché which features a buffet-open kitchen set up except its menu is centered on German-Eastern European cuisine. Publik Markette’s dining space has three areas accessible through one entrance with diners passing through an open kitchen-display of roasted pork, an array of pastries (watch out for the giant chocolate chip cookie), and the cashier’s post. A diner has three options of where to sit – concave booth chairs, picnic benches, or round tables next to faux trees. For our first appetizer, the unanimous choice was calamari. The presentation was far from the usual with the deep-fried battered squid resembling thick fries; another plus was its crunchiness throughout lunch and the smooth aioli sauce with its balanced garlic and mayo combination. The second appetizer was chicken satay with peanut sauce. Publik Markette is generous with serving size with each stick of chicken satay looking way thicker than the usual skewered scrawny chicken strips. The choices for the main course were variegated. My Nori Salmon bowl was huge in portion and flavor. Vegetables – lettuce, Japanese cucumber, edamame, mushroom, squares of seaweed, and strips of nori – cradled the more-than-matchbox-size salmon that was sweetish-salty to the palate. Theresia’s choice of Publik Pork belly, sitting on a bed of baby potatoes topped by arugula and other greens, was a smorgasbord of flavors. Her silence testified to her enjoyment of the seamless melding of flavors of the perfectly roasted, juicy pork belly mixing with the crunchiness of the greens, and soft potatoes. Meanwhile, Anto’s choice of the rich Pasta Beef Ragout was a carb-filled bowl of fettuccine topped with melted cheese and succulent beef ragout guarded by a piece of garlic bread. Conversation flowed from every direction, from serious thoughts on world issues to simple venting out of frustrations, as we polished off our lunches. If we were in Europe, an al fresco setting would have heightened the dining experience a few notches, but Jakarta is too humid to even think of dining without air conditioning, among other things. Fortuitously, Publik Markette has successfully recreated an elegant simulacrum of market dining with its far-from-gaudy setting and a menu that elevates the taste from pedestrian to delectable. Even the escalating din from the growing lunch crowd – a nightmarish, headache-inducing occurrence – didn’t have the same impact as I had imagined it would. Absolutely nothing ruffled the muted promise of Publik Marekette of a wondrous dining experience. Chef Sun Kim (L) adds the final touches to the dishes. Dinner is nothing different. It is as mundane as lunch, and alleviating the humdrum of dinner in Bekasi means facing the derrière – numbing, bumper-to-bumper traffic en route to Jakarta. The very thought of traveling is off-putting, but curiosity about Chef Sun Kim spurred me to book a table for one at Arts Café by Raffles. He was cooking dinner that Friday night. Chef Sun, head chef of Meta, a Michelin- star rated restaurant on Keong Saik Road, Singapore, opened his dinner with a trio of canapés. Canapé 1: tapioca fritters topped with roe and octopus, and sprinkled with seaweed. Crunchy, juicy two bites! Canapé 2: mushroom tart with broccoli and parmesan cheese. The first-and-only bite had me thinking of pizza except with a tantalizing flavour, and left wishing pizzas tasted like his mushroom tarts. Canapé 3: amaebi with tartar sauce. The cold canapé exploded in a burst of juicy flavours in the mouth punctuated by the garlic-onion toast it was served on. It did the trick of whetting the appetite for Sun’s six-course meal. Chefs are akin to magicians except they dazzle their audience – seated at their tables – with culinary magic. Sun Kim didn’t disappoint as he pulled one kitchen trick after another with aplomb. His first culinary trick was surreal in plating and taste. Resting in a rock-designed bowl was sashimi of kampachi with pomelo, shiso, and gochujang that offered a unique taste of seafood and pomelo which did a little tug-of-war on the tongue with the freshness of the seafood, zestfulness of pomelo, and a touch of spiciness. He followed it with scallop chawanmushi with clam cream, dill, and osetra caviar in a warm, glazed, black-and-white cup. The chawanmushi was soft, blending smoothly with the fresh scallop at bottom of the cup. Caviar on chawanmushi is a definite first for me and it elevated the flavour to a luxurious height. Sun Kim went for something far from nondescript for his third course. He upped the ante with slow-cooked octopus with homemade X.O. sauce and Jerusalem artichoke sitting on a warm, black bowl. It was like unwrapping a parcel with this dish. Lifting the bokchoy leaf (am guessing) revealed the octopus that cut easily into pieces and a succulence commingled with a piquantness that rolled around the tongue. The spiciness of the X.O. sauce slowly creeps up your taste buds which doesn’t numb them but ignite them. A palate-tickling surprise was the puréed artichoke (reminiscent of molecular gastronomy cuisine) in squid ink that added a soupcon of saltiness to the dish. Peek-a- boo! Find the slow-cooked octopus with homemade XO sauce and Jerusalem artichoke. Sun Kim’s fourth dish, grilled quail with mushroom ragu and parsnip taking centre stage on a huge white-black plate, was a new palate teaser. The tender quail tasted similar to chicken teriyaki, but the taste takes a different direction to a new, ineffable yet flavourful taste enhanced by the tangy parsnip. The guests at the table to my right finally arrived, and I unintentionally caught snippets of their chat. The yarn went something like this: Sun Kim was treated by the male guest to an Indonesian Padang dinner that he enjoyed immensely given its similarity to South Korean cuisine in terms of spiciness. It was not the case with his sous chef Jared who couldn’t handle the chilli, and was sweating buckets. As the guests to my right started their dinner, I was on my second to the last course which truly showed why Sun Kim is a Michelin-star chef. Called 40-hour cooked beef short rib shiitake mushroom purée, pickled shiitake, and buckwheat, the beef, hiding underneath yet another leaf, fell into bite-size pieces with a mere touch of the knife. Sliding the beef, pinned with mushroom and onion bits, across the buckwheat sauce and popping it in your mouth, everything melded into a perfect blend of tenderness, juiciness, and well-prepared beef. Peek-a-boo 2! Lift the leaf to discover the treasure called 40-hour cooked beef short rib. Sun Kim’s magical culinary show closed on sweet, fruity note. Sitting prettily in the middle of a chilled bowl was mango salsa with passion fruit sorbet, coconut, and mint. My notion of dessert is something chocolaty so I was bit sceptical about Kim’s choice, but part of Kim’s magic is making your scepticism fade away and pushing you to embrace confidence in him. Spoon in hand, I glided it from the coconut cream, crowned with mint syrup, down through the sherbet and the mango cubes. It was a beautiful salsa of seamless tanginess and sweetness with every bite. Dinner with Sun Kim was one amazing experience, and facing Jakarta’s traffic was worth it. There was always a treasure to discover in each dish, unearthing it as you go through the layers of the ingredients aesthetically plated in stunning crockery. Lunch in Bekasi has become a humdrum affair as the choices remain the same and predictable. At Grand Metropolitan Mall, for example, you have fish porridge and fried shimeji mushroom at Tawan; Hainanese chicken set at Imperial Kitchen; teriyaki chicken at Yoshinoya; and salmon-chicken set at Pepper Lunch. A new Vietnamese restaurant has opened, but eventually the fresh spring rolls lose its appeal. Kenny Rogers closed shop while a shabu-shabu restaurant has yet to open. An exciting lunch means braving the traffic to get to Jakarta and drown in the myriad choices confronting your senses. Nomz Kitchen & Pastry was a suggestion from Kelvin Gotama who has combed Grand Indonesia for worthy restaurants. The open-restaurant concept of Nomz Kitchen & Pastry where potential diners can see through the restaurant – the traditional walls are gone – lends it a warm, cosy café vibe completed by the earthy interior and furnishings, and a counter display that would make gourmands salivate. Its menu truly overwhelms one with choices so much so that it takes a while to order. The choice must be right because getting to Jakarta is no walk in the park. Following my rule of thumb when I dine in Jakarta, which means selecting a dish that is not regularly found in Bekasi or a dish that would better be interpreted, I opted for Chicken Katsu while my lunch partner, KG, went for the all-day Sunday brunch choice of Nomz Benedict. Our shared appetizer was Crumbed Escargot. My rice bowl was a satisfying melange of crunchy chicken, egg, and soft rice drizzled with sweet sauce and mayonnaise. The portion was huge, but a long lunch had it finished down to the last morsel. As for the escargots, they provided a nice contrast to the Chicken Katsu particularly when dipped in the balanced sweet-sour-spicy dip sauce. It was a pleasant surprise to discover that the escargots, which have a tendency to become tough when overcooked, were soft underneath the coating of crumbs, which I believe to be the kind used in cooking tempura. Meanwhile, KG’s Nomz Benedict was a filling and flavourful split bagel topped with poached egg, roe, arugula, and drizzled with hollandaise sauce. It goes without saying that an exciting lunch is far from rousing if it only focuses on food. A huge part of the excitement is the conversation, in which KG is adroit at much like the older brother Kelvin, with topics running the gamut of everything under the sun, including, naturally, gorgeous men with the initials of TH. Toby’s Estate at Grand Indonesia is next on our list for another exciting lunch at the city. It is another suggestion from gourmand Kelvin. It was the ube flower icing that rekindled the hunt that ignited the cake trail. 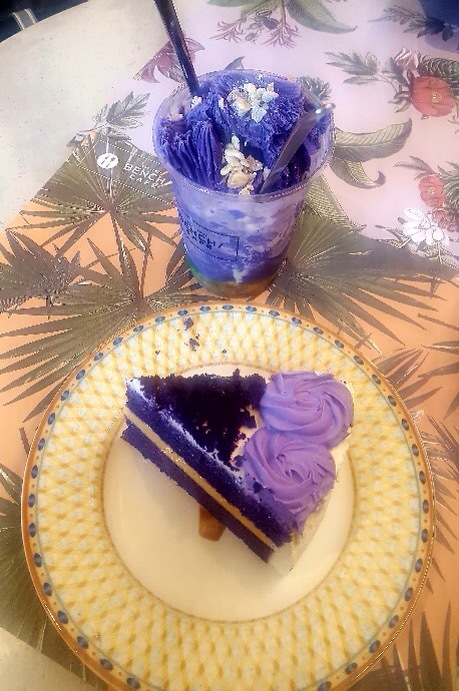 The ube flower icing added that punch to the palate after every bite. It was a must to have my fork glide down the slice from top to bottom because leaving out the ube flower icing completely marred the cake experience. To the uninitiated, ube (pronounced oo-beh) is roughly translated as yam, and back then in, I believe, the early ’90s, Red Ribbon was indubitably the ube cake maker. A craving for its ube cake meant popping by the nearest branch and getting a slice. But I lost my craving for it after being given a pitiable excuse the one time I set foot in a branch after years of being away that having a slice was no longer possible because there were no ube cakes that had been cut up. Fast forward to now, thanks to Instagram, I was put on the ube cake trail. Prior to the launch of their Classic Ube Cake last August, Cara Mia Cakes and Gelato in the Philippines teased cake lovers with videos of the ube cake being made from scratch: the main ingredient, halayang ube, or boiled yam, spinning away in the mixer. No shortcuts for this baker! No instant ube mix being peddled in the market for this ube cake! Joy! The hype lived up to its name, as every bite was a palate- satisfying bite that didn’t leave one cloyed, but sweetly satiated down to the last ube icing swirl and a promise to come back for more. Meanwhile, an outing Jakarta put me on a different cake trail – I was just looking for a very good cake which Bekasi is mournfully bereft of. The first serendipitous find was the Banoffie Pie from Nomz Kitchen and Pastry, an eatery with a warm café-vibe to it at the East Mall of Grand Indonesia. Ordered post-lunch, the bowl, which was good for sharing, was a merry mix of graham bits, slices of banana, ice cream, whipped cream, and chocolate shavings, and caramel sauce that completed the sweet coup de grace. Rounding off the cake trail was another stupendous find within the same mall but at the ground floor of the West Mall this time. The Greyhound Café had this Choco Banana Crepe that partnered well with the lemon grass tea thus making for a perfect high tea selection. The cake is two alternating layers of bananas, chocolate, and custard that ends with glazed bananas on top that – contrary to first glance – are not chips but soft – not mushy – bananas. Just like with the ube cake, it is a must to have the fork glide down the cake to get all the layers and savour all that thrilling choco-banana goodness. The cake trail is far from over because there are still a lot of untrodden cake trails.